Open Apereo 2019 is an international, inclusive event offered by the Apereo Foundation, a non-profit organization dedicated to developing and sustaining innovative open-source software solutions for education. Learn how higher education is using open-source software to help deliver the academic mission, control costs, and retain the capacity to innovate. Team-building. Collaboration. Inspiration. Institutional Experience. Networking. Tannis Morgan is the Director of the Centre for Teaching, Learning, & Innovation at the Justice Institute of British Columbia (JIBC). She is a key champion of OER at the JIBC, including conceiving their Zed Cred initiative several years ago and systematically working towards it even before BCcampus put out a call for grants. Tannis has helped steer the Justice Institute towards leveraging open source tools such as WordPress and Learn Dash to create affordable and open resources used by students and by the community. Click Here to read more about Tannis. Open Source Software and Privacy in Higher Education - How's the Fit? Ian Dolphin is Executive Director of the Apereo Foundation, and has been involved with open source software in higher education for almost twenty years. He is former Heady of eStrategy at the University of Hull, in the UK, and worked for the Jisc for two years. Apereo is a network of institutions like yours, where you can share experiences, learn from the experiences of others, and discover new collaborators. Apereo supports software used in thousands of educational institutions worldwide. Software developed and maintained by the Apereo Community include: Sakai, CAS, uPortal, Karuta, Apereo OAE, Bedework, Student Success Plan, Opencast, ELMS:LN, openEQUELLA, UniTime, and Xerte. In addition, Apereo's incubation process supports new projects as they find the path from innovation to sustainability. PAYMENT POLICY: Payment for the full amount of registration fees must be made prior to or on the first day of the conference. To qualify for the early registration rates, your registration form AND payment must be received no later than May 3, 2019. All registrations received or unpaid after this date will be processed at the regular registration rate. CANCELLATION POLICY: All cancellations received on or before the cut-off date of May 3, 2019 are eligible for a refund of fees paid, less a 10% cancellation fee. Cancellations received between May 3 and May 24 are eligible for a 50% refund of fees paid. No refunds will be issued after the May 24 deadline. Rates are given in U.S. dollars. Credit cards will be billed in U.S. dollars, and the individual financial institutions will convert at the prevailing exchange rate. Privacy is currently a big deal in higher education IT. The topic entered the EDUCAUSE “Top Ten IT Issues” list this year at number 3. So what’s new? High profile legislation such as the EU General Data Protection Regulation (GDPR) and California Consumer Privacy Act (CCPA) has both upped the compliance ante, and done much to generate awareness. These developments have been accompanied by high profile data breaches with international ramifications affecting millions of users at British Airways, Cathay Pacific and Starwood, amongst others, and a daily diet press stories of egregious misuse of user data by large technology platforms. Higher education is in danger of being caught in a web of multiple conflicting agendas. Ian Dolphin will survey the privacy landscape, and draw some preliminary conclusions about the location of open source software in relation to privacy. Somewhere along the last decade the web went from really accessible to everyone (inspect, click, edit) to requiring complex build routines and application development methodology just to make a button that clicks to set an alert message. The ELMS:LN team has stared down the monster and come up with a technology and workflow solution that can empower any developer to speed up the development of any project, Apereo or otherwise. Web components, a browser specification has been adopted by Firefox, Chrome, Safari, and Opera! Recent Edge announcements mean it'll be natively supported there too! There's still a ton to know in order to do web components and instead of having to learn Gulp, Roll-up, Polymer CLI, Lerna, NPM/Yarn publishing, compiling for multiple browser, the web component standard, data binding, and every other concept involved to just make that button issue an alert.. we've automated all of it. The entire learning curve of getting into building, managing, publishing, compiling, and implementing web components we've boiled down to a single library called WCFactory. Our team has used this tooling to develop and publish overWhat, Why, How, When, and Can I use web components? uPortal is the leading open source portal framework developed by and for higher education institutions, K-12 school systems, and research communities. uPortal continues to evolve and innovate through the contributions of a global community of academic institutions, commercial affiliates, and non-profit foundations. Are you interested in improving the usability of your product but don’t know where to start? This workshop will introduce participants to the basics of usability testing and research. We will cover how to select participants, how to select tasks for testing, and best practices when moderating tests. After covering the basics, we will work in teams to conduct an in-class usability test with real-world issues. Strategies for analyzing and sharing results will also be covered. openEQUELLA is a digital repository that provides a single platform to house your teaching, learning, research, media, and library content. openEQUELLA has been deployed for copyright resource collections, research materials, managing and exposing materials through websites and portals, content authoring, workflow, institutional policy, and organizational resources. openEQUELLA is currently in use in a wide range of schools, universities, colleges, TAFEs, departments of education, government agencies, and corporations worldwide. With over 10 years of history, the platform is a mature solution written for the Java platform. In its recent history, openEQUELLA was proprietary software licensed to adopters by Pearson. openEQUELLA graduated from the Apereo Incubation process last year, and is now open source. Come learn what openEQUELLA can do, and how it can provide industry-leading Content Management System / Learning Object Repository capabilities to your Portal, Learning Management System, or other systems on campus. Come learn about the developer community around the application, the current roadmap, and how you can get involved. Come learn how to deploy and upgrade EQUELLA, tie in integrations, configure, and customize the application. Time will be allotted to get openEQUELLA running on participant's laptops, guide them in the foundations of the application, and discuss how they can enhance their current CMS/LOR solution with openEQUELLA. Participants are encouraged to bring a laptop with Docker installed (demos will be run on Docker 18.06.1-ce). UniTime is a comprehensive educational scheduling system that supports developing course and examination timetables, managing changes to these timetables, sharing rooms with other events, and scheduling both students and instructors to individual classes. This half-day workshop will cover a walk through all the various components of UniTime. The aim is to provide a comprehensive overview of the existing UniTime functionality and how it can be used with various timetabling needs of an institution of higher education. We will also talk about the integration of UniTime with other systems at a university. An exclusive demo instance of UniTime will be available during and after the workshop where the participants will be able to interact with some of the material covered during the workshop. We hope to do some hands-on during the workshop too. The participants of the workshop are invited to ask questions at any time, especially if they already have some experience with UniTime, to help steer the workshop. You can also send us any questions you would like to get answered during or after the workshop beforehand atworkshop[at]unitime[dot]org. Opencast is a flexible, scalable and reliable video capture, distribution, and management system for academic institutions, which can meet needs all the way from large-scale lecture capture applications to supporting self-service video studios. What's new in recent Opencast releases (versions 5 and 6), and what you can expect to see in Opencast 7. The Sakai QA Testathon is back again this year! It's like a hackathon, but for QA testing. Come join us for a hands-on session where you become part of the Sakai QA team. We will provide information to "onboard" you as a QA tester, and then guide you step by step to sign up for a Jira account, find a Jira to test, review the Test plan, perform the testing and update the Jira. The full test cycle! Be a part of making Sakai better with real, live contribution. Bring your laptop and we will provide the rest. No programming experience needed. The last twelve months have seen big changes in the way we think about and develop user interface components for uPortal. Beginning with version 5.1 (May 2018), uPortal supports Web Components as first-class members of the uPortal Ecosystem. Web Components are more conventional (in terms of how you would approach coding them), much faster to develop, and vastly more modern than Java Portlets. As we head into mid-2019, Web Components are rapidly becoming the focus for front-end development in the portal. 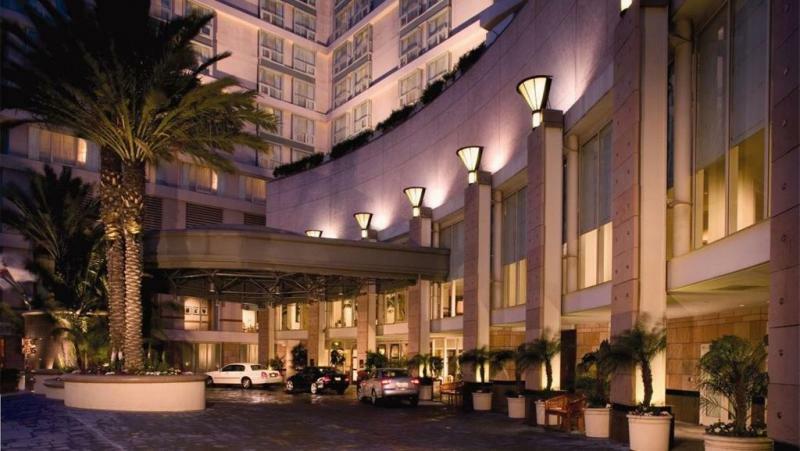 Open Apereo 2019 will be held at the Omni Los Angeles Hotel at California Plaza. PLEASE NOTE that the Apereo Foundation is obligated to fulfill certain contractual obligations with the Omni Los Angeles Hotel at California Plaza by having attendees fill a set number of guest rooms. By staying at the Omni Los Angeles Hotel you help to ensure that funds go toward the event and the organization's mission, not toward paying for empty hotel rooms. Additionally, we've heard time and again how valuable networking and "hallway conversations" are to attendees of Open Apereo and it's sister events. By staying at the Omni Los Angeles Hotel you greatly increase your odds of having those kinds of meaningful interactions when moving around the hotel during the event. The Open Apereo conference is a great opportunity to socialize and network with your professional colleagues. We will be organizing a few social activities and networking events to do just that. Some of the events will require a sign-up during the registration process. See below for the options available during registration and for some items to do on your own. Please be sure to register for all social activities that you plan to attend. Some of the activities require payment in advance, and some don’t, but we would like to get a headcount for both paid and non-paid activities for planning purposes. See LA from new heights! Enjoy the sunset with 360° views, two open-air observation decks, interactive technology features, and the Skyspace Bar. You can even ride the thrilling Skyslide if you dare! Cost: $28 per person (ticket price includes 1 Skyslide ride and 20% discount for food, bar and gift shop). Plan to catch a movie with your friends at the iconic TLC Chinese Theater! Movies and showtimes will vary depending on what is playing in June. Closer to the date we will announce what film and showing the group will be attending. Register for this activity to be notified about group movie arrangements. Explore Los Angeles' Historic Downtown with your fellow attendees. This private group walking tour will last approximately 2.5 hours. Tour departs at 5pm from Pershing Square, meet in the hotel lobby at 4:40pm to walk to the tour starting location. Group reservations require a 12 person minimum, therefore booking early ensure that we can proceed with the private tour! Take a 3-hour driving tour that features the glitz, glamour, and celebrities of Hollywood. Sights include the Hollywood Walk of Fame, the Chinese Theater, Mulholland Drive, Beverly Hills mansions, and a trip down Rodeo Drive and the Sunset Strip. Tour departs at 7pm, meet in the lobby at 6:50pm for group hotel pick-up. Group reservations require a 10 person minimum, therefore booking early ensure that we can proceed with the private tour! Cost per person is TBA. Please reserve your space if you are interested in attending. We are looking into transportation options, and require headcounts to determine pricing. We will be in touch with more details as we gather them. Affordability of education has become a key issue, not simply for students and educational institutions, but for society as a whole. Open source software can be a key element in developing an institutional IT strategy that focuses on enhancing student success, while helping to control costs. At Open Apereo 2019, you’ll find out more about how your institution can engage with open source software and the communities that support it. You’ll learn how open source works, and how it can work for your institution. You’ll see first-hand how a community responds to the challenges of today by innovating for tomorrow. Above all, you’ll return with real data based on real-world experiences of development and deployment that can inform your institutional practice and strategy. Open Apereo 2019 is an international, inclusive event offered by the Apereo Foundation, a non-profit organization dedicated to developing and sustaining innovative open-source software solutions for education. Ad Hoc Meeting Rooms: Ad Hoc Meeting spaces will be available for first-come, first-served usage during conference hours. More information will be available soon regarding availability and how to sign up. Lightning Talks are fun, five-minute presentations, clumped together for an exciting and fast-paced way to share and gather new information. We invite you to come share your knowledge, tricks and techniques or join us in learning from others in the Apereo Community. More information will be provided about timing and location. The greater Los Angeles area is a vast and sprawling metropolis with many cities, neighborhoods, and micro-communities. We have compiled a list of suggestions for things to do and places to visit while you are here. Have some fun in the California sun with a few of these on-your-own activities! Los Angeles Metro has a list of common summer destinations accessible by train or bus. There are many, many restaurants and eateries in the LA area. First, you'll notice that restaurants have a letter grade on the door. This is a rating of cleanliness from the city. You want to eat at an "A" restaurant. Less than an "A" means the establishment hasn't met all health codes. A Quick Guide to Tacos in Los Angeles, 2017 Edition. Links to options big and small. A popular symbol of LA. See the Chinese, glimpse the Hollywood Sign from the observation level, see the El Capitan Theatre across the street, gawk at people dressed in costume. A short subway trip from downtown. LACMA next door. Petersen across street. Not to be missed! Take a walk along the Pacific Ocean at Southern California’s number one visitor attraction. Culture, food, shops, and more. Downtown LA. Check out the architecture. Downtown LA. Culture, food, shops, and more. One of the oldest parts of downtown. Resource to find deals for numerous museums, plays, etc. An amazing museum, including two new complexes. Check our BCAM for contemporary art. Two locations, one in LA off the 405 and one at the coast on Pacific Coast Hwy. Both are amazing! South Grand Ave near Pershing Square exit. A contemporary art museum in downtown Los Angeles. A small space, but great photography. In 1-2 hours, you'll see it all and be ready for your next adventure in LA. If you're a car nut, this place is for you. Just across the street from LACMA. Not sure if there will be performances, but worth a look! If a play's your thing, check out these great venues. Great view of LA, planetarium, and much more! Shakespeare. Griffith Park. Check schedule to see if playing during conference. Learn about the American West. Home of Space Shuttle Endeavor. Check out the art and architecture. Cool place to explore contemporary art for sale. The main beach communities of the Los Angeles Area are, from north to south: Malibu, Santa Monica, Venice, Marina Del Rey, Playa del Rey, and Manhattan Beach. Unfortunately, Downtown LA is on the east side of town, so in order to dip your toes in the Pacific, you'll need a car, bus, or train. Access to the beaches is free, but parking is not (in most locales). If you're looking for suggestions, here is a link to recommendations for 15 great LA area beaches. In Anaheim. A significant commute from downtown LA. A short freeway drive from downtown LA. Accessible via the Metro Red line. In Santa Clarita/Valencia. A commute from downtown LA. A significant drive. Not as impressive as the other major parks. Great for kids. Gene Autry Museum across the street. Long Beach. A significant commute from downtown LA. In Burbank, CA a short drive from downtown LA. Beautiful location, learn about Malibu history, amazing tile. A collection of art galleries with new and old art and photography for sale. Architecture. Pasadena. Might remember it from Back to the Future. Frank Lloyd Wright. 'Nuff said. The art at bus stations, rail stations, etc. If you know a magician or member, ask for passes... it's worth the trip! Not in Beverly Hills, but a mall nonetheless. Open-air walking mall. Moments away from Santa Monica pier and beach. Another major mall next door. A commute from downtown LA. Another popular open-air mall. Farmer's market nearby. See the sights, buy some things. Mann's Chinese next door, El Capitan Theatre across the street. At the steps to Universal Studios. Lakers, Clippers, Kings, concerts, etc. Open Apereo 2019 takes place from June 2nd to 6th at the Omni Los Angeles Hotel at California Plaza. The conference will showcase the work of Apereo communities, provide networking opportunities for participants, and will feature keynote speakers from the broader higher education community. The products of our software communities - Sakai, uPortal, CAS, the Open Academic Environment, Bedework, Opencast, UniTime, Karuta, Xerte, the Apereo Learning Analytics Stack, Tsugi, POET and EDexchange – are designed and built by education, for education. They are also potential contributors to what Educause have called the “Next Generation Digital Learning Environment” – a more flexible component and component-based environment to support academic practice. Open Apereo is the primary face-to-face networking event on the Apereo calendar. It’s a great place to meet, discuss, and build partnerships that have a positive impact on the education landscape. The event depends, to a significant degree, on commercial sponsorship. Sponsorship lets us keep the registration fee low and encourage attendance by our diverse and distributed community. If you are interested in participating as a sponsor or obtaining more information, please email us at conference[at]apereo[dot]org. "The Next-Generation Digital Learning Environment: A Keystone for Student Success" will focus on the relationship between the vision of an agile, flexible and robust learning environment and student success. The past year has been very eventful for Sakai. The Sakai-11 release was completed with the new frameless (Morpheus) portal, new Grade Book, responsive design, and many other game changing features to bring Sakai very much in line with the best LMS systems in the marketplace. A large number of Sakai sites are moving their production to Sakai 11 and we are working on a Sakai-12 release. This presentation will will give a brief summary of the Sakai project to date as well as expectations for the next year. Tsugi enables the production of a truly "next generation" Learning Management System that enables an "indie" publisher to deploy a topic-oriented, LMS, MOOC, LOR, and App Store using low-cost readily available hosting infrastructure. Come find out more! Hear how the University of Limerick is working with Sakai and Big Blue Button to provide new virtual classroom assessment opportunities. Adding the functionality of grading rubrics to Sakai as a native tool. A collaborative community effort to rubric integrations with Sakai Assignments and Gradebook. Using Sakai and Tsugi for delivery. The shifting landscape of higher education in South Africa is providing abundant incentive for faculty to examine their current lecture structure and to look at incorporating additional learning technologies. Part of our ongoing delivery is focused on supporting faculty in producing audio and video resources for improved learning opportunities. My UW for You: Workshop Edition. MyUW is delivering a modern, responsive, designed campus portal user experience to UW-Madison and to other campuses in the University of Wisconsin system using uPortal and some free and open source add ons for uPortal enhancing its capabilities and implementing an alternative user interface layer. Portals? uPortal!? What is this Béchamel? Université Pierre et Marie Curie - Sorbonne Universités arned presents uPortal seen under an approach of a collective intelligence and a learning organization. Deploying CAS? Want to discover new developments and current practice with the premiere open source single sign on solution? Need to get up to speed with Grouper? The identity management and single sign on track at Open Apereo 2017 is just for you! Open Apereo 2017 - the open source conference for education - takes place in Philadephia June 4th to 7th. Apereo CAS: State of the Project. Having successfully delivered a major release about 7 months ago, the Apereo CAS project has been marching ahead with full speed preparing for its next upcoming feature release in the CAS 5 series. This session intends to provide a summary of CAS server achievements over the past year with specific focus on the coming feature release. Some statistical data about the general health and adoption status of the project will be detailed and we shall also touch upon a future roadmap for the project based on community input and feedback. Attendees will take away a fuller understanding of the project, are provided with the opportunity to share suggestions and recommendations directly with the project maintainers and hopefully learn of ways to contribute more and get involved with the community. Grouper is an enterprise access management system built by and for higher education, and is a key component of Internet2’s Trust and Identity in Education and Research (TIER) initiative. Designed for highly distributed and heterogeneous information technology environments, Grouper is uniquely suited to address the complexity and flexibility required by the modern institution. This seminar will explore the latest Grouper release, demonstrate a variety of real world use cases, and review the much anticipated TIER Grouper Deployment Guide which is slated for release in April 2017. The deployment guide aims to distill diverse community examples into specific TIER guidance and recommendation for achieving a variety of identity and access management capabilities. If you are planning to get started with a CAS deployment, this is the intended workshop session for you. The session will focus on the features, configuration options and build/deployment practices of the Apereo CAS server release and the path to their adoption for existing deployments. We will of course be conducting a hands-on session walking deployers through a series of dynamic build/deployment exercises and depending on availability and time, may also delve into integration strategies with client applications. Specific topics for the session are authentication, authorization, principal resolution and attribute release, managing service registrations, multifactor authentication, protocol support and more. Guests, visitors, and others whose identities are not managed in source systems (such as HR or student systems) often need access to education and research services. Like many other institutions, Lafayette College had previously tried to shoehorn these identities into existing systems with all the attendant problems of such an arrangement. Lafayette looked to the COmanage Registry to provide capabilities for managing these non-traditional identities. This session will discuss Lafayette's business processes and requirements surrounding sponsored accounts, review the capabilities of COmanage, and provide an overview of the technology, implementation methods, and integration considerations of the new COmanage-based solution. Using xAPI to generate actionable data for learners, faculty, designers and program managers at Penn State. Notre Dame experience with the Apereo Open LRS and integrating multiple sources of xAPI and Caliper data. Notre Dame is providing a central repository for learning analytics to capture learning experiences from multiple sources - learn from their experience. Need to understand xAPI and profiles? The Experience API (xAPI) expands the possibilities for learning analytics by providing the common means for systems to communicate with each other about learning activity. While xAPI makes it possible to acquire data about learners’ activities, this information provides little benefit if one cannot design to acquire meaningful data, interpret that data, or improve the learning design based on the insights gained from such data. Fortunately, Profiles are becoming available which accelerate best practices and remove obstacles in creating and analyzing meaningful data. In this workshop, participants will explore how to work with xAPI and a growing index of profiles as well as gain an understanding of basic principles of using data effectively and designing to provide meaningful feedback. Participants will apply these principles in determining a data strategy to support particular learning outcomes. The aims of the Apereo Learning analytics initiative (LAI) are to accelerate the operationalization of Learning Analytics software and frameworks, support the validation of analytics pilots across institutions, and working together to avoid duplication of efforts. Today, the community has developed an unified vision to build an open and scalable reference architecture for the Learning Analytics. The session briefly covers the current status of the development of the architectural components which include Learning Record Warehouse, Academic early alert systems, Intervention, Student advising systems and Dashboard systems. Time will be set aside to discuss other community priorities in this domain and how others can get involved.